With “Logan” finally hitting theaters this weekend, it is important to understand that Hugh Jackman’s acting capabilities range far beyond that signature role of the Wolverine which he has owned since the turn of the century. Amongst his finest performances is “Prisoners”, a 2013 thriller directed by Denis Villeneuve (“Arrival”, “Sicario”). In this movie, Jackman stars alongside Jake Gyllenhaal and the pair truly provide top-notch acting throughout this intense who-dun-it story. 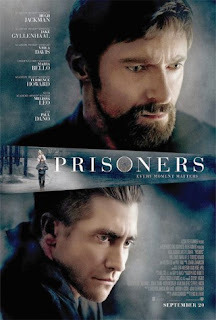 Nominated for just one Academy Award (Achievement in Cinematography), “Prisoners” certainly deserved even more recognition than that and is absolutely one of the most overlooked films of 2013. Keller Dover (Hugh Jackman) is a man living in rural Pennsylvania. Following a Thanksgiving dinner with family and friends, his young daughter and her playmate suddenly go missing. As soon as authorities are notified of the abductions, an investigation is led by Detective Loki (Jake Gyllenhaal). Over the course of several days, a few different suspects arise as the search for the girls continues. It doesn’t take long for Dover to become impatient with the police and he begins to take the law into his own hands. “Prisoners” is an incredibly complex movie loaded with many serious themes and layers. Perhaps more so than anything else, the film raises the very tough question of: Just how far will we go to protect the ones we love? There are also some religious undertones present, carefully shown through well-crafted shots and the thorough characterizations of Dover and Loki. Jackman and Gyllenhaal deliver, perhaps their strongest performances with the portrayals of these two morally complicated individuals, providing the driving force for this movie. Jackman’s character of Dover, intensely exemplifies how one can lose grip of their faith and morals when experiencing a nightmare situation like this; as shown through the extreme actions he takes during the movie. On the contrary, Gyllenhaal’s portrayal of Loki illustrates a morality struggle in a different way, as his character feels the continuing pressure of solving the mystery at hand before it’s too late. “Prisoners” is a grim movie that delivers its thought-provoking messages through a pair of outstanding performances. While its dark violence definitely isn’t for everybody, this film is strung together by an intricate sequence of suspenseful moments. All of this is topped off by a powerful ending that is not easily forgotten. “Prisoners” is a hidden gem that is well worth a viewing for anybody who hasn’t seen it. Copyright 2013-2018 The WIndham Eagle. Simple theme. Powered by Blogger.